We compare eruptive dynamics, effects and deposits of the Bezymianny 1956 (BZ), Mount St Helens 1980 (MSH), and Soufrière Hills volcano, Montserrat 1997 (SHV) eruptions, the key events of which included powerful directed blasts. Each blast subsequently generated a high-energy stratified pyroclastic density current (PDC) with a high speed at onset. The blasts were triggered by rapid unloading of an extruding or intruding shallow magma body (lava dome and/or cryptodome) of andesitic or dacitic composition. The unloading was caused by sector failures of the volcanic edifices, with respective volumes for BZ, MSH, and SHV c. 0.5, 2.5, and 0.05 km3. The blasts devastated approximately elliptical areas, axial directions of which coincided with the directions of sector failures. We separate the transient directed blast phenomenon into three main parts, the burst phase, the collapse phase, and the PDC phase. In the burst phase the pressurized mixture is driven by initial kinetic energy and expands rapidly into the atmosphere, with much of the expansion having an initially lateral component. The erupted material fails to mix with sufficient air to form a buoyant column, but in the collapse phase, falls beyond the source as an inclined fountain, and thereafter generates a PDC moving parallel to the ground surface. It is possible for the burst phase to comprise an overpressured jet, which requires injection of momentum from an orifice; however some exploding sources may have different geometry and a jet is not necessarily formed. A major unresolved question is whether the preponderance of strong damage observed in the volcanic blasts should be attributed to shock waves within an overpressured jet, or alternatively to dynamic pressures and shocks within the energetic collapse and PDC phases. Internal shock structures related to unsteady flow and compressibility effects can occur in each phase. We withhold judgment about published shock models as a primary explanation for the damage sustained at MSH until modern 3D numerical modeling is accomplished, but argue that much of the damage observed in directed blasts can be reasonably interpreted to have been caused by high dynamic pressures and clast impact loading by an inclined collapsing fountain and stratified PDC. This view is reinforced by recent modeling cited for SHV. In distal and peripheral regions, solids concentration, maximum particle size, current speed, and dynamic pressure are diminished, resulting in lesser damage and enhanced influence by local topography on the PDC. Despite the different scales of the blasts (devastated areas were respectively 500, 600, and >10 km2 for BZ, MSH, and SHV), and some complexity involving retrogressive slide blocks and clusters of explosions, their pyroclastic deposits demonstrate strong similarity. Juvenile material composes >50% of the deposits, implying for the blasts a dominantly magmatic mechanism although hydrothermal explosions also occurred. The character of the magma fragmented by explosions (highly viscous, phenocryst-rich, variable microlite content) determined the bimodal distributions of juvenile clast density and vesicularity. Thickness of the deposits fluctuates in proximal areas but in general decreases with distance from the crater, and laterally from the axial region. The proximal stratigraphy of the blast deposits comprises four layers named A, B, C, D from bottom to top. Layer A is represented by very poorly sorted debris with admixtures of vegetation and soil, with a strongly erosive ground contact; its appearance varies at different sites due to different ground conditions at the time of the blasts. The layer reflects intense turbulent boundary shear between the basal part of the energetic head of the PDC and the substrate. Layer B exhibits relatively well-sorted fines-depleted debris with some charred plant fragments; its deposition occurred by rapid suspension sedimentation in rapidly waning, high-concentration conditions. Layer C is mainly a poorly sorted massive layer enriched by fines with its uppermost part laminated, created by rapid sedimentation under moderate-concentration, weakly tractive conditions, with the uppermost laminated part reflecting a dilute depositional regime with grain-by-grain traction deposition. By analogy to laboratory experiments, mixing at the flow head of the PDC created a turbulent dilute wake above the body of a gravity current, with layer B deposited by the flow body and layer C by the wake. The uppermost layer D of fines and accretionary lapilli is an ash fallout deposit of the finest particles from the high-rising buoyant thermal plume derived from the sediment-depleted pyroclastic density current. The strong similarity among these eruptions and their deposits suggests that these cases represent similar source, transport and depositional phenomena. We thank Tim Druitt for his thorough constructive review, an anonymous reviewer, and John Stix for remarks and careful editorial work. 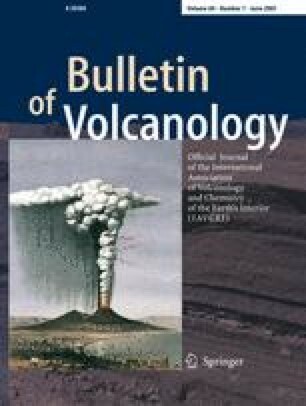 We likewise acknowledge support and insights from colleagues at Mount St. Helens, particularly CD Miller, RP Hoblitt, R Waitt, HX Glicken, S Kieffer, R Christiansen, D Peterson, and RV Fisher, among others mostly represented as the authors of USGS PP 1250; colleagues at the Institute of Volcanology and Seismology in Kamchatka, particularly A Petukhin and M Alidibirov; and co-workers and staff at Montserrat Volcano Observatory as represented by RSJ Sparks, SR Young, and the authors of Geological Society Memoir 21. We salute the pioneers of directed blast studies, GS Gorshkov at Kamchatka and the Kuriles, DR Crandell and D Mullineaux in the Cascade Range, and A LaCroix in the Caribbean region. Rocky Crandell is responsible for inviting BV’s hazards and research participation at St Helens, and BV is grateful for this. The research of K Wohletz and G Valentine provided important insights on blast dynamics. BV is indebted especially to colleagues A Neri, T Esposti Ongaro, A Clarke, and C Widiwijayanti for the privilege and pleasure of our continued collaborative modeling research. C. Widiwijayanti also aided the submission of the manuscript. This research was financed chiefly by grants from the US Civilian Research & Development Foundation, and the Petrology-Geochemistry Program of NSF, with additional support by the volcano observatory organizations noted above.